Dont waste your money! I went to the Langley location with my black lexus Rx350 a few weeks ago and it left major scratches along my hood. I immediately showed the attendant of what had happened and he wrote up an incident report but still need to see the manager. I went back to show the manager my vehicle and they flat out denied that its from their wash. Its very sad how a business can operate like this and mistreat their customers. Its very disappointing that they wont take any responsibilities with this situation and just completely deny everything . I know for a fact that my truck did not have those scratches prior to the wash. Anyways I have gone through ICBC and seek legal advice because this is something that people shouldnt have to go through. Its not the $300 deductible thats my concern its the principal of the situation that they think they can just lie their way out. 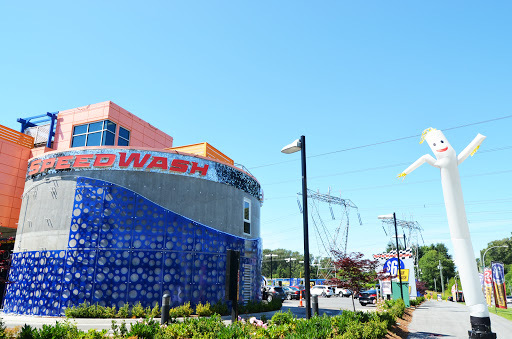 Once it opened they offered one third place free car wash, overall great experience. Car came out clean given there were few small spots were missing, but still acceptable. The second time try it with the first place wash, gotta say the $15 was well spent I must say most of the people saw my car though I gotten a new car, it even washed the tire; the tires had the black gloss. Recently went back and off the bat choose the first place wash again. Once the Washington was completely did a walk around, there are still minor spots missed probably due to the angle issue, which is understandable. However the tires this time didnt come as nice as described before. So I dont know what happened this time hopefully its not those places where quality is presence only in the beginning, with lack of supervising falls the quality. I have been to this place few times and I have used my debit card every time. today I went to this place and requested to have the debit machine brought up to my car like last times and the lot attendant looked at me as if Im a idiot and started muttering words. I didnt understand what was his problem, he should have simply explain it to me what ever is happening rather than swearing while I was reversing my vehicle. my 2 kids were in the car and was astonished for his reaction. I would definitely request the management to have a look at the situation and speak to the colleague, cos you might be loosing customers soon if this continues. Car wash is speedy wash but didnt DRY the car as its needed to be Dry, As in EUROPE they do it with same type of car wash, which Dries better & take some time to Properly Wash. Its needed to be figured out & maybe needed to add some more time for drying & washing the Car. My Car wheel got a wheel Cap which was broken here because the guide Guy didnt paid attention while I was driving in the car wash. My side mirror on Toyota Corolla was turned outward with the clothes during the wash. Tires polished its nice, I will try again but not going to buy $20, will try another package Due to NOT DRYING THE CAR & SPEEDY WASH.
Its ok overall, after driving by multiple times i decoded to take the wifes car in. I got the 2nd highest wash and it did ok, good enough i was willing to take my sports car there. The free vacuum was a nice feature. Upon returning with my car, i got the most expensive wash. I had just come back from a road trip. It did not get the brake dust off the wheels that well and the bugs on the front although a lot better were still unacceptable. In the future i will be continuing hand washing my car or using a wand wash for half the price. That being said i would use this place for the wifes car. WOW!!! Just wow!! I show up, thinking this is magnificent! Then a professional looking uniformed kid shows me which way to go. Then he says Hi, Im gonna check all your windows, wipers etc. He walks around your car and makes sure that everything is safe!!!!! Amazing client service. And you get free vacuum with every wash! Heres the funny thing: Im sitting in my car writing this, my car is not even totally dry yet and I havent tried the vacuum, but I already love this place, Speedwash just made a friend and a loyal client. Hands down best experience ever. Dont bother going here if you expect your car to actually be clean when it comes out. I bought the most expensive wash and it didnt even clean the area on my windshield where the wipers dont reach, let alone the rest of my car. It barely uses any soap and what soap does manage to get on your car is hardly washed away by the rinse. They have attendants standing waiting at the pay station to push the buttons for you but maybe they should use that money towards higher water pressure to actually clean the cars. Will not be going back. This place is a disappointment to say the least. This was my second experience, of which left me consistently unsatisfied. The vacuum cleaners seldomly function and I seem to accomplish a thorough (five minute) clean in my driveway in comparison. So far Ive yet to meet anyone within my circles of my friends and colleagues, whom upon visiting this establishment, were content at the very minimum. Im beginning to suspect the very few and far between positive feedback granished - is from their small groups of influence. One of the worst car washes I have been through. Free Vacuum cant make up for the amount of scratches and damage that occurred on my vehicle after the wash. Even after speaking to the attendant, he apparently didnt see "anything at all". Even told me to move on and didnt have the decency to give me contact information to talk with a manager. At the end, I think Im going to stick to washing my car myself instead of going to speed wash. Paid $20 for best wash with waxes etc. Gave me most basic wash, I asked for read and how it knows which wash to give me as it was obvious car in front of me got way more, they said it was based on order that you paid. When I went through again got way more coloured soaps and waxes. Car still not clean nor dry. Complained as I for sure got scammed on first wash. Did not seem to care. I will not return.